Abstract: While the fierce competition between the manufacturers is great for consumers, it can be rather difficult deciding what memory is best to buy especially for novice enthusiasts. OCZ has really taken the memory market by storm and they're advancing so quickly that even the "traditional big boys" such as Corsair, Mushkin and Kingston are having a hard time catching up. OCZ is on fire right now, and it seems they're the real 'kings' of the memory market... at the moment anyway. While the fierce competition between the manufacturers is great for consumers, it can be rather difficult deciding what memory is best to buy especially for novice enthusiasts. From dual channel memory kits to single DIMMs, with all the different speed variations even I get confused sometimes. The OCZ dual channel PC3700 Gold Edition Rev 2 is intended for the no-fuss enthusiast who wants a fast machine without a lot of tinkering. The DIMM's we're testing are both 512MB in size, which when running in dual channel mode, gives us a nice 1 GB of system memory. With applications sucking down more and more system resources, 512MB (total) is often not enough anymore. 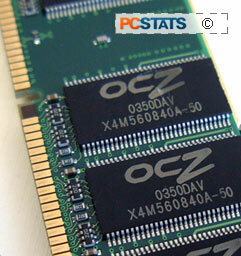 At stock speeds the OCZ memory is rated to run at 233 MHz, while maintaining timings of 2.5-3-3-7 at 2.7V. Not the greatest timings, but they're more aggressive than most other high speed DIMM's on the market. Please keep in mind that this memory is intended for i865PE/i875P based motherboards and OCZ states that themselves if you take the time to look through the specifications. Everyone knows that the heatspreaders are more for looks than functionality, and to grab your attention, OCZ have slapped on a pair of gold plated heat spreaders. Will they keep your memory running especially cool - nope. Are they shiny - yup. Upon removing the heat spreaders we found that the DRAM had OCZ markings on them. They read X4M560840A-50 but unfortunately not much other information is known about them. Seems OCZ has given the memory a 5ns rating so they're overclocking the memory by default. While I know some of you may not like that, I don't see it as big deal. I'm more interested in what the DRAM will actually do, rather than any listed specs. Because OCZ does not have the manufacturing capability to produce their own DRAM, they buy them from various manufacturers. Most enthusiast memory manufacturers do this as well. OCZ have told us they source their DRAM from ProMOS, a company which is based out of Taiwan, and holds 7% of the world DRAM market share. Quite a few readers have e-mailed me asking why manufacturers stick with TSOP-II packaging instead of going with BGA or WLCSP? After all the latter are more advanced packages, and should in theory be able to run faster thanks to less signal noise. The simple reason is, in real world situations it's not necessary. More advanced packaging techniques do not allow manufacturers to clock the DRAM higher, and also it's more expensive to make. What DDR2 DRAM will be using is another question... but for good ole DDR memory it's just not necessary.